John D. Rockefeller was a famous Businessman from USA, who lived between July 8, 1839 and May 23, 1937. He became 97 years old. 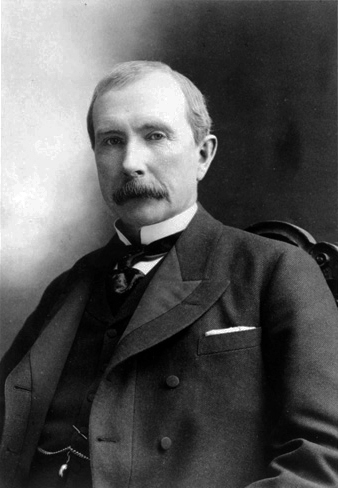 He was the founder of Standard Oil Company, which dominated the oil industry and was the first major U.S. company. Rockefeller revolutionized the petroleum industry and defined the structure of modern philanthropy. In 1870 he founded the Standard Oil Company and head the company until he officially retired in 1897. Standard Oil began as a partnership formed by John D. Rockefeller, his brother William Rockefeller, Henry Flagler, Jabez Bostwick, chemist Samuel Andrews, and Stephen V. Harkness in Ohio. While the crazy demand for kerosene and gasoline rose, rose Rockefeller's fortune and became the world's richest man and first American with a fortune worth more than billion dollars. Adjusted for inflation, he is often regarded as the richest person in history. Rockefeller spent the last 40 years of his life in retirement. His fortune was mainly used to create the modern systematic approach of targeted philanthropy with foundations that had a major impact on medicine, education and research. His foundations pioneered the development of medical research, and was instrumental in the eradication of hookworm and yellow fever. He is also the founder of both the University of Chicago and Rockefeller University. He was a devout Baptist and supported many Christian institutions throughout his life. Rockefeller lived through his life in complete abstinence from alcohol and tobacco. He is born under the zodiac cancer, who is known for Emotion, Diplomatic, Intensity, Impulsive, Selective. Our collection contains 27 quotes who is written / told by John, under the main topics: Friendship, Finance, Leadership, Motivational. "A friendship founded on business is better than a business founded on friendship"
"Don't be afraid to give up the good to go for the great"
"Do you know the only thing that gives me pleasure? It's to see my dividends coming in"
"Charity is injurious unless it helps the recipient to become independent of it"
"The way to make money is to buy when blood is running in the streets"
"The only question with wealth is, what do you do with it?" "The most important thing for a young man is to establish a credit... a reputation, character"
"The ability to deal with people is as purchasable a commodity as sugar or coffee and I will pay more for that ability than for any other under the sun"
"Singleness of purpose is one of the chief essentials for success in life, no matter what may be one's aim"
"Next to doing the right thing, the most important thing is to let people know you are doing the right thing"
"It is wrong to assume that men of immense wealth are always happy"
"If your only goal is to become rich, you will never achieve it"
"If you want to succeed you should strike out on new paths, rather than travel the worn paths of accepted success"
"I would rather earn 1% off a 100 people's efforts than 100% of my own efforts"
"I know of nothing more despicable and pathetic than a man who devotes all the hours of the waking day to the making of money for money's sake"
"I have ways of making money that you know nothing of"
"I do not think that there is any other quality so essential to success of any kind as the quality of perseverance. It overcomes almost everything, even nature"
"I can think of nothing less pleasurable than a life devoted to pleasure"
"I believe that thrift is essential to well-ordered living"
"I believe that every right implies a responsibility; every opportunity, an obligation; every possession, a duty"
"I believe in the dignity of labor, whether with head or hand; that the world owes no man a living but that it owes every man an opportunity to make a living"
"I always tried to turn every disaster into an opportunity"
"Good management consists in showing average people how to do the work of superior people"
"Good leadership consists of showing average people how to do the work of superior people"
"Every right implies a responsibility; Every opportunity, an obligation, Every possession, a duty"
"Don't blame the marketing department. The buck stops with the chief executive"